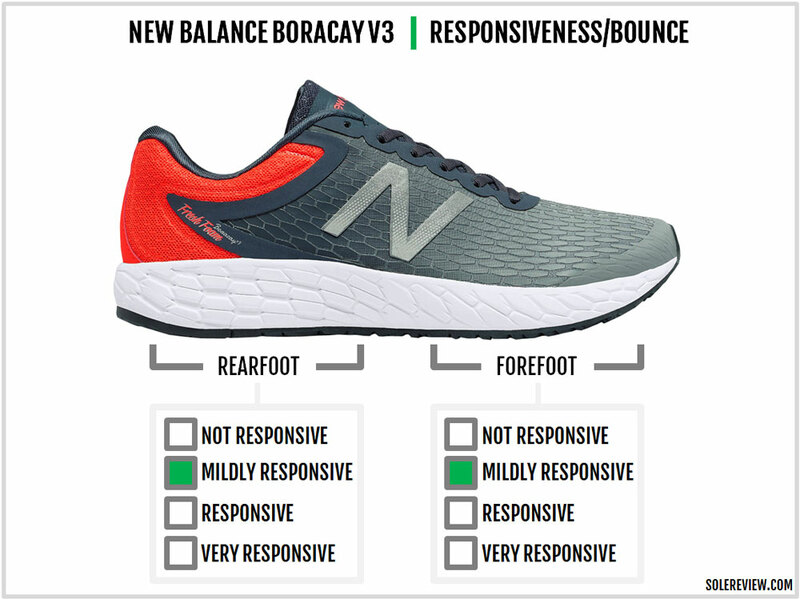 New Balance’s marketing pitch: Continue your relentless pursuit of fast with the Fresh Foam Boracay v3. Upper: Mesh with high-density rubberised printing detail, synthetic overlays. Midsole: Single-density, compression molded foam. 4 mm heel-to-toe offset. 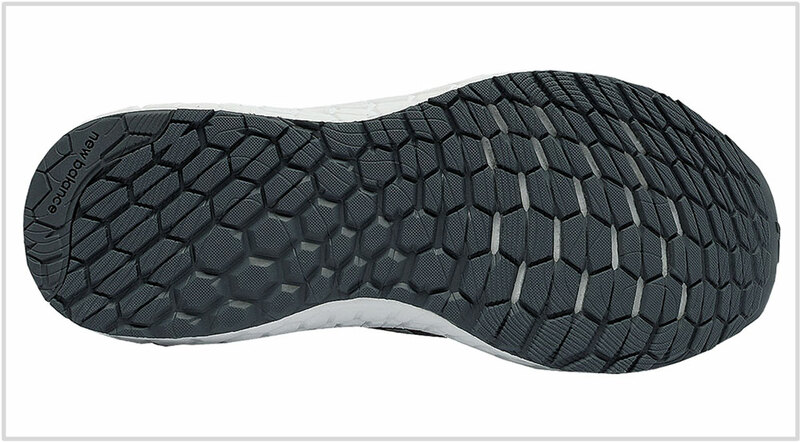 Outsole: Hard carbon rubber crash pad under the heel edge, softer blown rubber under the rest of the outsole. The Boracay returns after an unofficial year of absence. It retains the smooth midsole ride of the V1, but in a slightly firmer avatar. The new urethane-coated upper fits narrower than before and comes with an inner sleeve. 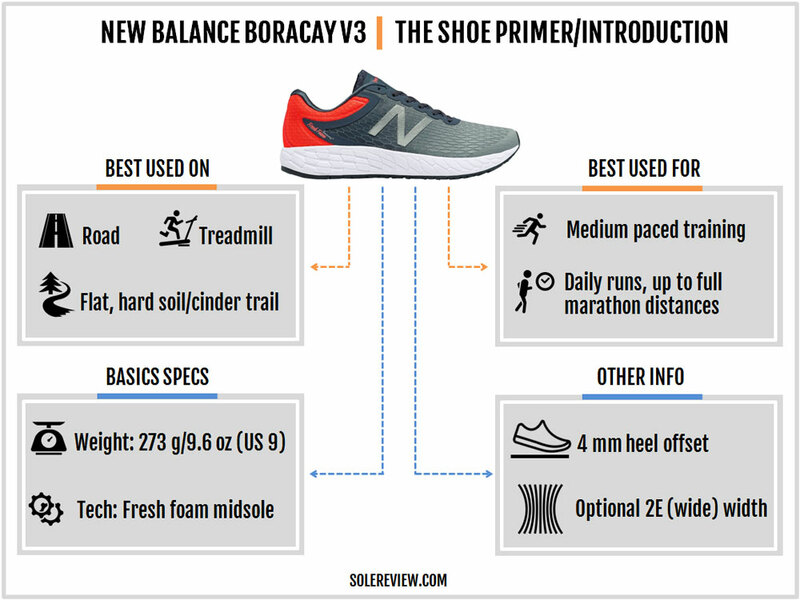 Last year, the New Balance Boracay went on an unofficial sabbatical. The Boracay v1 (named after the island in the Philippines) showed up in 2015 as the successor to the Fresh Foam 980 and then was radio silence in 2016 – at least in the United States. The Boracay V2 did make it to the international markets, though. It had an upper with a synthetic mid and rearfoot cage, and a midfoot design similar to the New Balance 1080 or the ISOFIT from Saucony. Its upper used two different kinds of mesh, and unlike the original 980 or the Boracay v1, the upper was fitted with an internal sleeve. We’re not sure why New Balance chose to market the V2 halfheartedly. But anyway, the Fresh Foam Boracay V3 is here, and that’s all we care about. The V3 is a markedly different Boracay than the V1, and we say that for two reasons. The V3 has a sleeved tongue, and the ride is slightly firmer due to updates made to the midsole and insole design. The fit is also noticeably tighter than the V1 because of the new upper. If you liked the Boracay V1, you should take to the V3 too – if you can live with the narrower and warmer upper, that is. This year’s Boracay has a streamlined upper profile. Except for the heel center, the mesh is covered completely with no-sew overlays. The eyestay uses a strip of synthetic leather, and the midfoot is flanked by reflective logos which come in handy during low-light conditions. The forefoot and midfoot mesh have rubberized printing, with a colony of mini hexagons all over. The mesh is slightly stretchy, but not as elastic as it appears. The mesh structure does not allow much air to pass through, so the new Boracay runs extremely warm. Take note if you’re planning on using the Boracay as a summer shoe – your feet is going to get sweaty. The toe area is reinforced both from the inside and outside. Inside the toe box, there’s a semi-stiff component. Outside, there’s a urethane covering for protection. 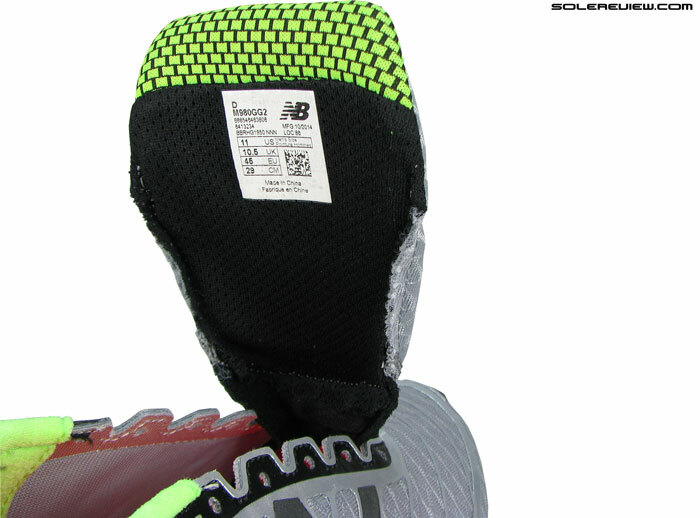 Back in the rear, there’s a full-sized counter inside the heel. The heel collar takes some time to break in; the walls are a bit high, and initially a bit stiff. You can’t see it in the pictures, but the mesh on the heel sides is molded. The collar lining is soft, and the foam filling grips the foot well. If your last shoe was the Boracay V1, then you’ll notice the changes made to the tongue area. Another thing you’ll find missing is the piece of elastic at the front of the tongue. The Boracay V1’s tongue had a stretchy section right under the first and second lacing row, which allowed you to stretch the tongue over the foot. 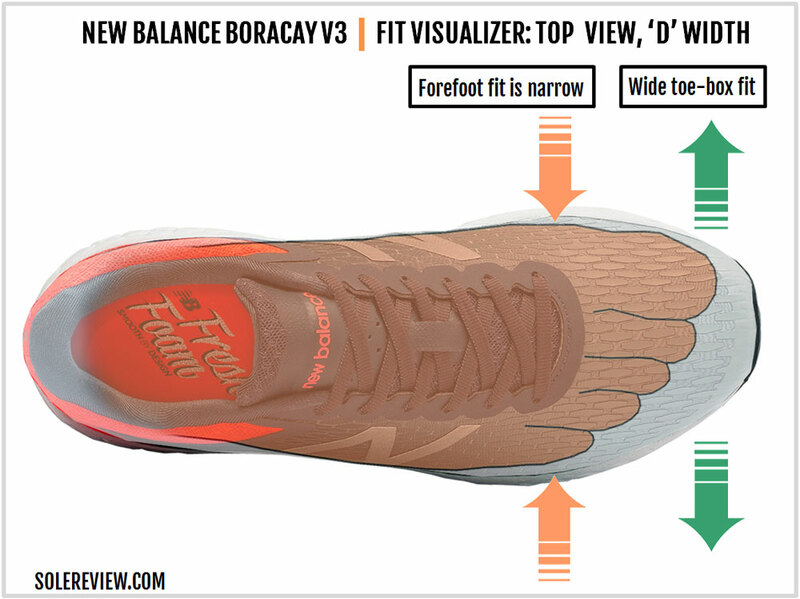 The Boracay V3’s tongue does not have this elastic, and hence the tongue might feel shorter. Otherwise, the length is same across the V1 and V3. The semi-stretchy, flat laces are carried over from the V1. They lie flush over the tongue and cinch well without coming loose. Fundamentally, the midsole and outsole design haven’t evolved a lot since the Boracay V1. The 4 mm offset midsole is a single-density piece of EVA foam, and the outsole is constructed of two-piece rubber. But there are a few updates which affect the ride behavior of the Boracay V3. We reviewed a couple of other Fresh Foam models recently, and both had one thing in common. The molding detail on the outer midsole sidewall changed from convex (scooped) hexagons to concave (filled up) ones. This might not seem like a major change, but the updated hexagons do end up making the ride firmer. As pointed out in our Zante V1 review, the convex hexagons are easier to compress than the concave ones. So much like the redesigned 1080 and the Zante, the Boracay’s outer (lateral) midsole also switches to the concave (outwards facing) hexagons. The medial (inner) side continues to use concave hexagons, the same as the Boracay V1 and V2. This is one of the factors which makes the V3 firmer than the V1. The second factor is the updated insole. 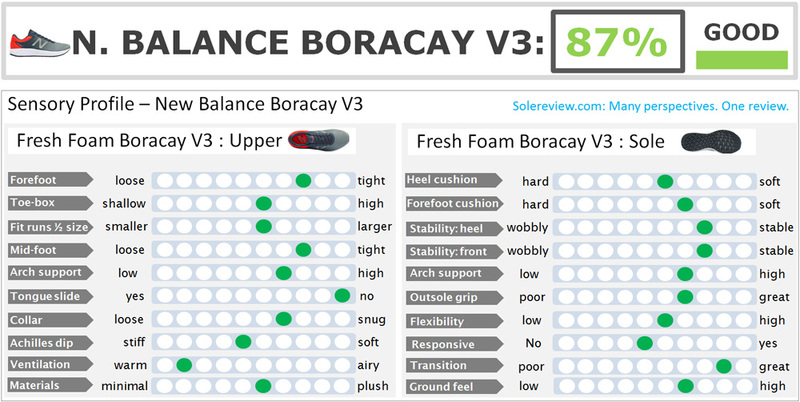 The Boracay V1 used an Ortholite insole which was made of soft, open-cell foam. The V3 no longer uses Ortholite and replaces that with a firmer Durapontex insole. Unlike the blown foam Ortholite, the V3’s removable Durapontex sockliner is made of a denser foam. This bumps up the sense of firmness just under the foot; the bright side is that the responsiveness levels go up. Below the insole, there’s a sheet of foam lasting, same as the previous Boracays. 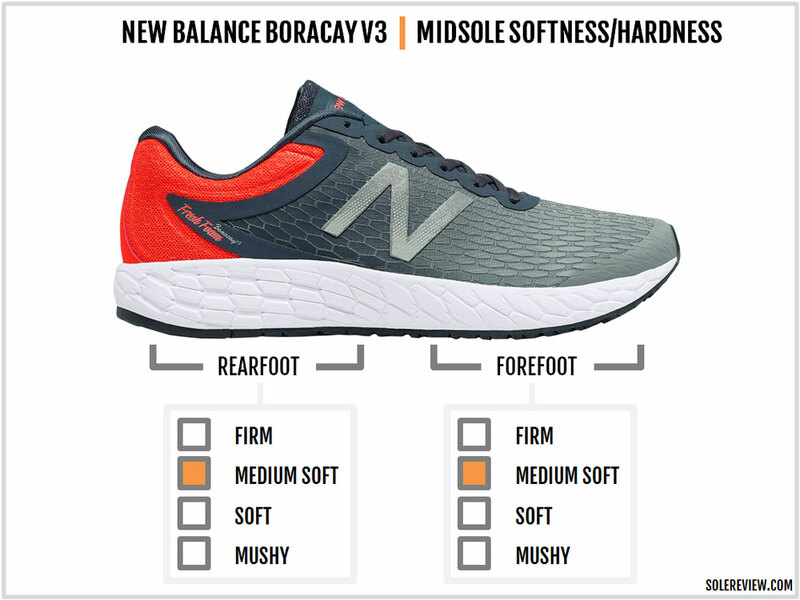 The outsole is completely covered with rubber, which is now becoming a common design language not just for the Boracay but most of the New Balance line as well. The Boracay V3 makes a few tweaks to this format, and this again is similar to what we observed on the 1080 V7. The direction of the hexagonal outsole lugs is now oriented side-to-side, versus the lengthwise placement on the Boracay V1 and V2. The V3 also adds slits under the forefoot which increases the flexibility. While the Boracay V2 had slits too, the lugs weren’t aligned sideways. We must point out that the most of the outsole is made of a softer blown rubber which grips well. Only the crash pad under the heel edge is made of a harder compound. While the outsole seems like a single piece of rubber, the crash pad is a separate piece. And like the 1080 V7, the Boracay’s heel edge has a bevel/angle for gradual landings. There is plenty of rubber, and the midsole is relatively firm. 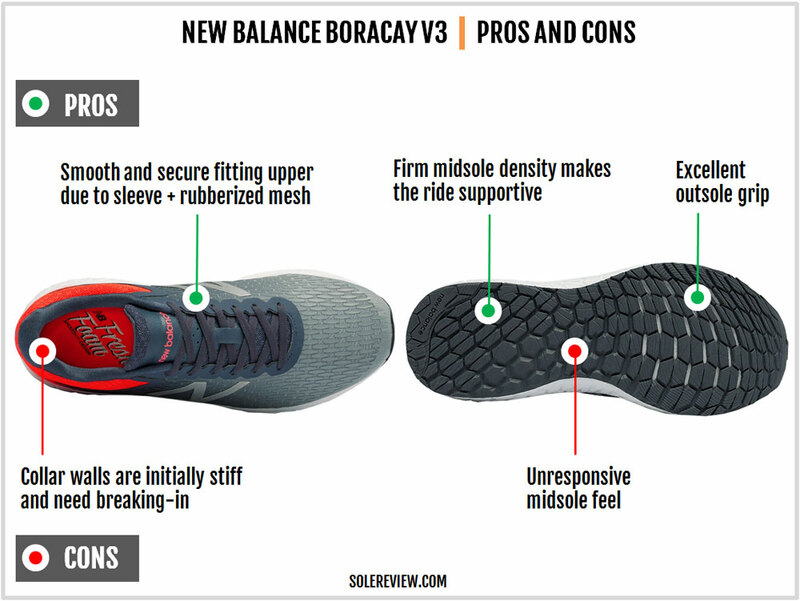 So durability should not be an issue with the Boracay V3, except for a long-term loss in cushioning and outsole wear. 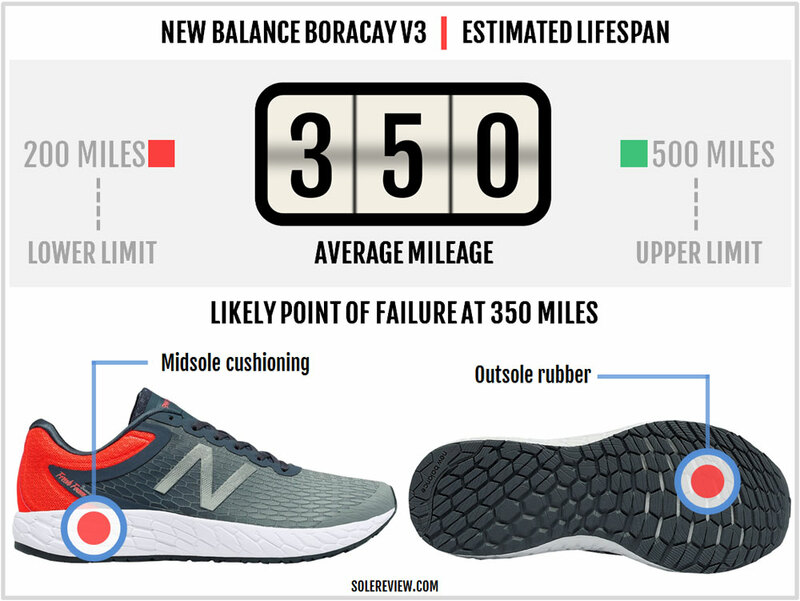 A mileage of 350 is what you should get with the Boracay V3. The toe-box fit is just right. There’s isn’t a lot of room above your toes, but the bumper does not squish your foot either. 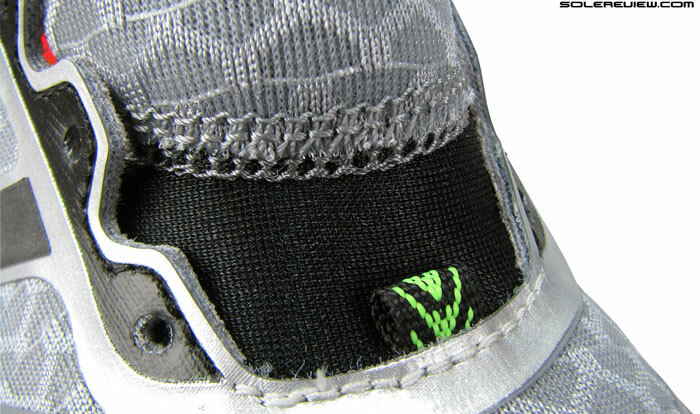 The midfoot grips well (and better than the V1) due to the elastic sleeve, and the tongue offers adequate insulation from the lacing pressure. We had called out the V1’s scratchy tongue edges back then, and that is a problem no more with the elastic gusset. The heel holds well due to the internal counter and the foam padding, except that the high collar walls need some time to break-in. 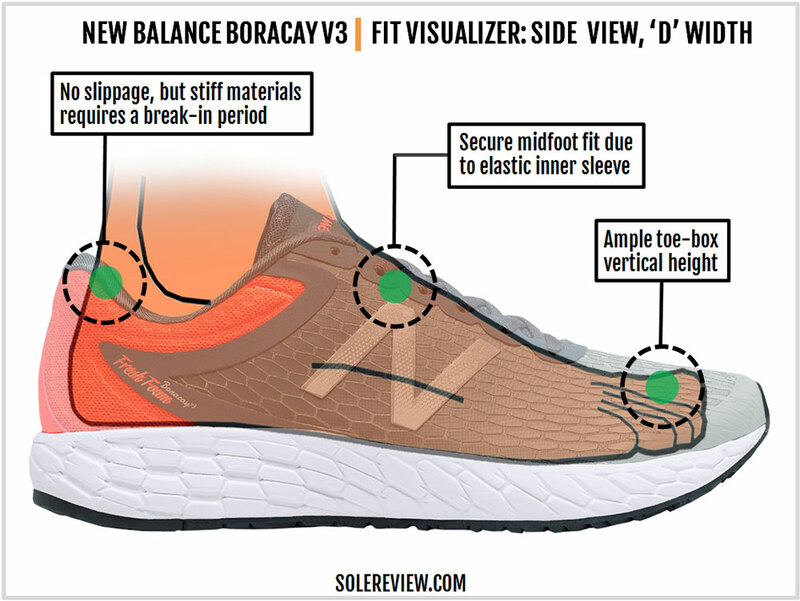 The Boracay V3’s forefoot fit is quite narrow. The mesh with its urethane layering hems in the foot and the elastic midfoot gusset further adds to the snug feel. In contrast, there’s nothing to complain about toe-box width. There’s enough space on either side. 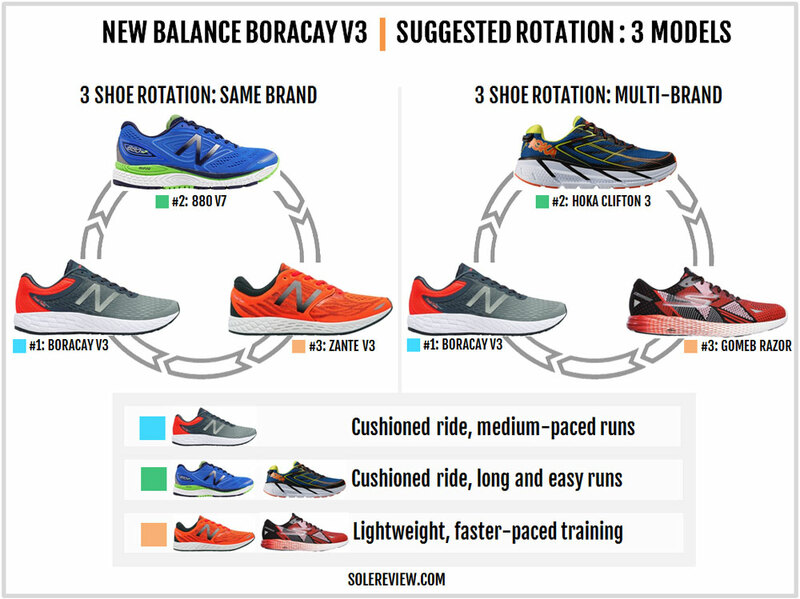 Whether you like the narrow forefoot fit or not depends on how you use the Boracay. For faster paces, the race-like fit feels great as it provides a secure, locked-down sensation. But if you’re looking for a relaxed feel, then you need to buy the 2E version of the Boracay V3. The Boracay’s cushioning is halfway between the 1080 V7 and the Zante V3 (1980). This isn’t a very soft shoe; the ride is accented with firmness. The Fresh Foam midsole used in the 980 and the Boracay V1 had a firm-ish quality, and so does the V3. A change in softness will be noticed from the V1 due to the new Durapontex insole and redesigned midsole. The layer just under the foot isn’t squishy as the Ortholite; it’s cushioned in a different way. Another way to put it is that the Boracay feels generously padded underfoot, but just not in a very soft way. As such, the Boracay is road-worthy as far as long distance runs are concerned. The shoe is good for half-marathons, as well as the full 26.2. If you need a shoe for faster runs, then the Zante V3 or Pace V2 are better alternatives. 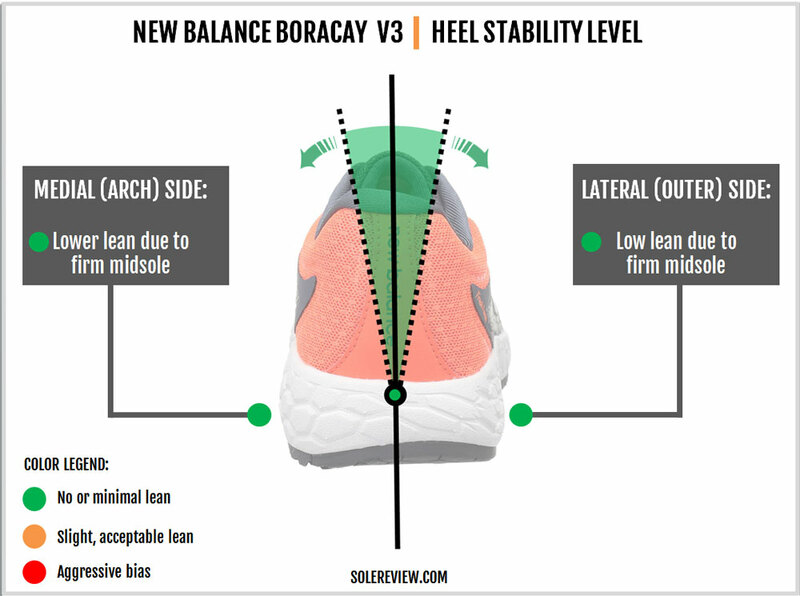 Do keep in mind that the Boracay’s midsole has a 4 mm drop, so make sure you’re accustomed before attempting longer runs. Except for the first version of the Zante, none of the Fresh Foam midsoles have exhibited a responsive/bouncy quality. That said, the V3 feels mildly responsive on account of the new Durapontex insole. Compared to the Ortholite insole made of soft blown foam, the V3’s new sockliner feels slightly more resilient and springy. 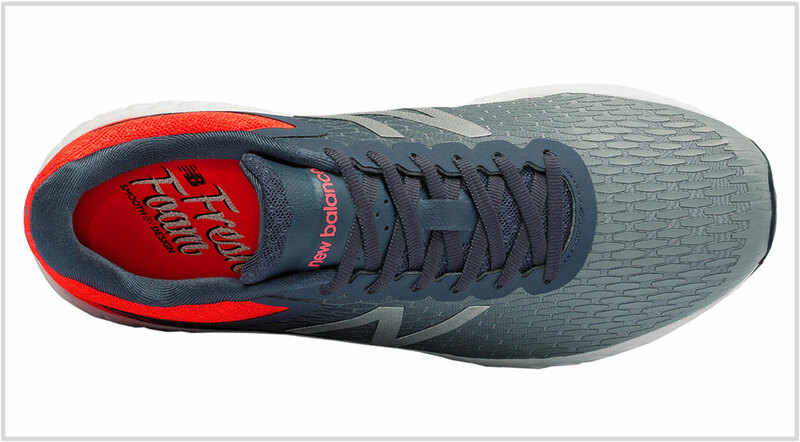 What the Fresh Foam lacks in the responsiveness department, it makes up in the support and transition quality. The non-mushy foam platform makes the ride very supportive, be it the rearfoot and front. And when you take into factor design elements like a single-material midsole and a full coverage outsole, the result is a very smooth and consistent ride quality. The foam isn’t overly soft, which means that there are no sink-spots to bog you down. The outsole design with its uniform design helps with efficient progressions too. The angled heel edge smoothens rearfoot landings, helped by the separate rubber crash pad which splays out on footstrike. The Boracay’s smooth and supportive ride is one of its stronger points. When viewed in isolation, the Fresh Foam compound isn’t particularly responsive or special in any way. It’s only when one experiences the Boracay as a sum of parts that you appreciate the whole ride quality. As a bonus, the blown rubber outsole grips very well on most surfaces. The insides feel smooth due to the added midfoot sleeve and the overall seamless construction. And about the narrow upper – whether it is a negative or positive will depend on your point of view. A snug fitting upper is good for those who crave ample lock-down; for others, not so much. And because of the dense printing, the upper runs very warm. Reflective trims on the sides help with runs in low-light conditions, and the Boracay’s lightness (273 gms/ 9.6 oz) is a positive. On the surface, the V3 uses plenty of new materials such as the hexagon-dotted mesh. But most of you would be curious to know how the Boracay V3 differs from the V1 at a functional level, so we’ll do a quick round- up of the changes. The cushioning quality is firmer due to the insole change (now denser) and the change to concave hexagons on the outer midsole. To say that the Boracay V3 is 20% firmer than the V1 sounds right. The upper fit is much snugger in the forefoot and midfoot due to the new mesh design and the inner sleeve; the V3 adds an elastic sleeve which was absent on the V1. Increased flexibility is what you get on the V3. That happens because of the sideways placement (which is new) of the outsole lugs, and the tiny slits which make the outsole more flexible. The Zante V3 goes well with the Boracay. It’s an ounce lighter with a quicker feel, which makes it a good fast training shoe. On the other hand, the 1080 V7 feels too close to the Boracay. 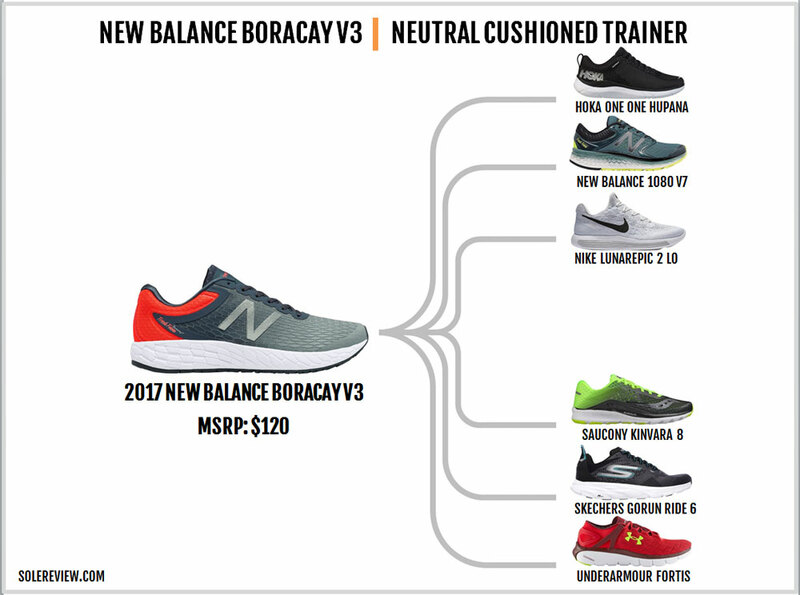 Instead, the New Balance 880 V7 adds better rotational value. You get the easy cushioning feel from the dual-density midsole, and there’s more room inside the upper. If a low heel offset, and increased cushioning in a single-density midsole form is what you want, then the Hoka Clifton 3 could be your shoe. There’s the characteristic Hoka abundance of foam cushioning, and it’s got a half-decent upper too. You should consider the Skechers GoMeb Speed 4 in case you want a racing shoe with a 4 mm drop. The single-density midsole has a no-fuss, economical quality to it, and the knit upper offers a secure lock-down without feeling uncomfortable. 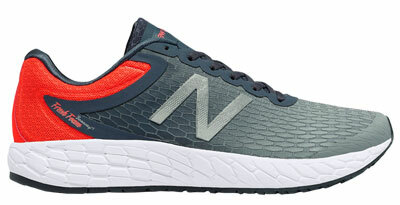 The Boracay is unofficially a New Balance 980, a level below the cushioned 1080. But there are two things which put the Boracay in a slightly tangential category. One, it’s pretty lightweight at below 10-ounces. Two, the difference between its rearfoot and forefoot stack height is a mere 4 mm (drop), which makes the shoe different than a conventional trainer which usually has a drop of 8 – 10 mm. So while it is hard to bring up exact matches for the Boracay in other brands, there are a few models worth a mention. In our opinion, the Hupana from Hoka One One is the closest to the Boracay. It’s got a low 5 mm offset, and a ride quality which is well cushioned with a firm tinge. Compared to the Boracay, the Hupana has more upper room. Just by the virtue of its 4 mm drop and low weight, the Skechers GoRun Ride 6 comes a close second. The Ride 6’s midsole delivers a much softer cushioning, though. The Ride 6 still features the pillar-based midsole design which produces a soft ride. Comparing the Saucony Kinvara 8 to the Boracay might seem a bit of a stretch, but the 4 mm offset Kinvara’s neutral cushioning manners are closer to the Boracay than one would think. The Kinvara turned much softer with the version 5 and beyond, so it’s only a cushioning notch below the Boracay. Looking purely from a cushioning angle, then we can think of a few other shoes. 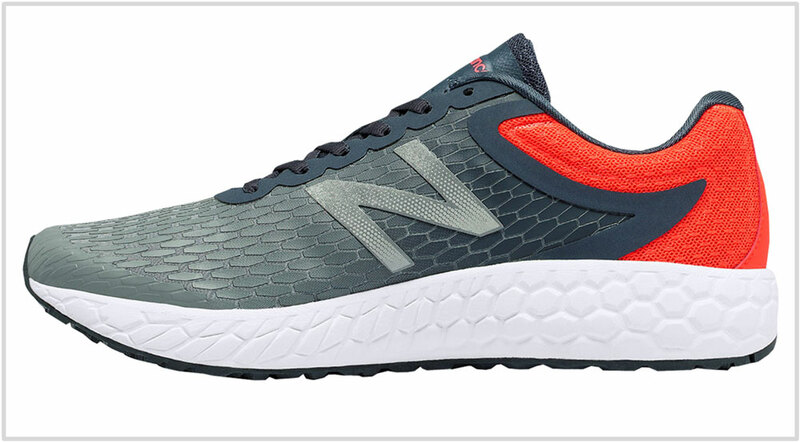 The New Balance 1080 V7 shares a similar (but thicker) Fresh Foam platform with a higher heel offset of 8 mm. The Nike Lunarepic Lo Flyknit 2 is another cushioned trainer, and the UnderArmour Fortis combines lightweight cushioning with a knit upper. This review is made possible by crowdsourcing multiple reviews from the solereview community. Improve it by submitting a review here. Learn more about how our reviews are designed.